Jon Moores, who scored two of Chesterfield's goals and was named man-of-the-match. (PHOTO BY: Kev Randall Photography). A superb second-half fightback to beat Bloxwich was Chesterfield’s consolation prize for confirmation that they have just missed out on the league title. 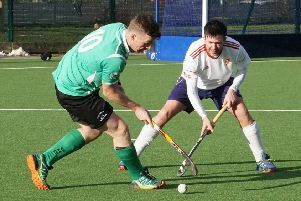 Chesterfield, already promoted, learned that leaders Telford and Wrekin had recorded a last-gasp victory over Burton, which means they are crowned Midland Men’s Hockey League, Third Division champions with one match to spare. But at least coach Christian Battye’s side also proved what they are made of, recovering from 2-1 down at home to Bloxwich to triumph 5-2. Battye said: “We had an iffy first half, but Bloxwich were brilliant and made it very hard for us to create chances. The visitors were a goal up inside two minutes and although Jon Moores levelled almost immediately, Bloxwich deservedly regained their lead before the break. A pulsating second period saw Chesterfield run in four goals without reply, although it took a moment of magic from Josh Beardsley to equalise. 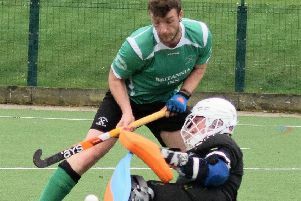 Vice-captain Moores bagged his second to make it 3-2, leading marksman Joe Morton struck his 20th goal of the season and Johnny Hancock wrapped things up.